Interleague play has existed in MLB since 1997. So prior to '97, if you were to look at your favorite team's records against other clubs, all you will see are teams that may or may not have a DH on the roster. But everything changed on June 12, 1997 when the Rangers and the Giants played a regular season game that counted in the standings. My White Sox have an all time interleague record of 163-120, However, the team they have faced the least from the National League are the Mets. Only seven games against them, with a 4-3 record. There are no games scheduled between the two clubs in 2015, so who knows when we'll be visiting Shea Citi or when the Mets will bus into Comiskey US Cellular. Fortunately, Keith from Home Run Apple makes plenty of visits to my part of the world. Another blogger that is in the "oh, here's a bunch of cards for you" trade cycle that I have, Keith recently dropped a fine group of cards on me. 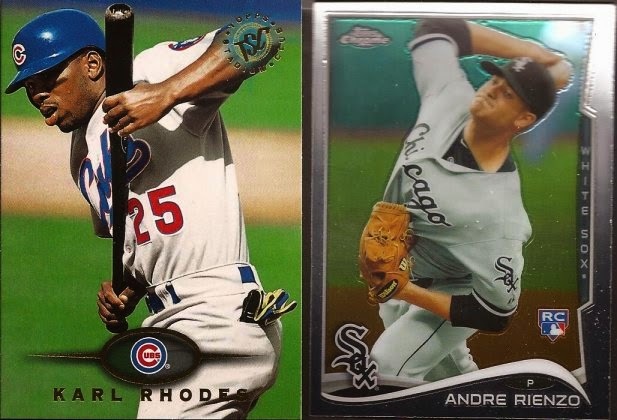 Man - the Cubs had ugly road uniforms in the late 90's. I was shocked when they honored them last year with these as part of the throwbacks remembering Weeghman Wrigley. That was a bad design. But a nice bunting card, for sure. Rienzo - we had high hopes for him, and now Miami can have those hopes. I think he'll do ok if he gets his control in order. Pauly goes into the Pauly binder. Jake goes into the mini binder. It's organization great? Lots of A&G in the envelope from Keith. 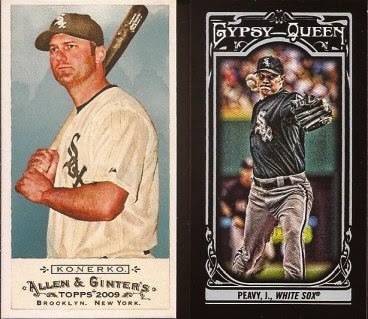 I don't have a lot of A&G in my White Sox monster box, so these (along with others) packed in a couple of the years. I know '09 in not a popular year, having to come right after the great '08 design, but it's a style that is growing on me. Keith was wise to drop 2 of the Konerkos in the package, so this is a fine dupe, since it goes right to the Pauly binder with the others shown. While the design is total crap, that Prizm is not too bad a card. Thanks for the cards, Keith. Maybe 2016 will see us visit a borough other than the Bronx. Couldn't disagree with your assessment of the Cubs '90s unis if I tried. Easy in my top-10 favorite MLB jerseys of all-time.